2nd Edition - Revised and Expanded! that you just don't know how to handle? Maybe you're an EMPLOYER who isn't having any luck hiring the right Personal Assistant? Are you tired and frustrated training and retraining new candidates? Want someone trustworthy with great skills? but don't have a clue where to start? "I got my books yesterday and yours by far is the best! I wish I hadn't wasted my money on the others." 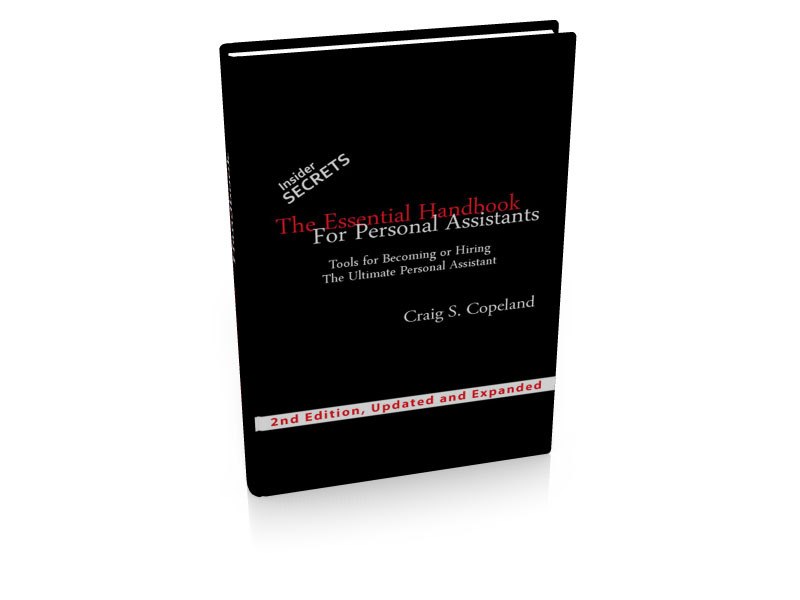 "An important resource for Personal Assistants. Written from deep experience, Craig paints a spot-on depiction of the work in useful detail and thankfully, with great humor. The book delivers on its promise in spades." "Finally, a true "insiders" guide. As a recruiter placing very high level Personal Assistants, I found this book to be extremely informative, useful and with a ton of good ideas and pointers. Wish I had written it myself." These are tools you can use your very first day. Even if it's your first time! It's crucial to your career that you learn how and where to get the best training in this field. There are only a few resources at your disposal. And they can really help you get to the next level. What they don't tell you about are the other skills you may need that they don't teach. This guide will give you the practical advice and inside knowledge to becoming a top notch Personal Assistant. Tons of people apply for the same position. So how do you get there first? Jockeying for the same position, how do you beat the competition to the finish line? You'll need an edge. Something that gives you a big advantage over others. In this guide you'll get tips and techniques on networking, how to use connections you may already possess. Tips on volunteering. And the most coveted methods for going through the back door to get to the top. Do you know exactly how to avoid the mistakes that can keep you from finding that amazing job? In a running race the difference between the winner and those who come in second or third comes down to microseconds. Not days, not hours, not minutes, just seconds. When you lose out on a job it's not that you were the worst, but more likely that someone was slightly better than you. So how do you get the edge over the competition? The tools inside the Essential Handbook for Personal Assistants will let the person hiring know instantly why they need to choose you over the other candidates. How do you know what "must have" tools you'll need to do the job right? Even the most seasoned Personal Assistant may not have all the tools he needs at his disposal to get the job done right. So where do you get them? How do you know what you'll need? Inside the guide are techniques and systems to enable you to find and use the proper resources to handle every task. You'll be given the steps to make sure every goal you set gets completed. "You know about them, you've heard of them, but rarely will you ever see them. At least not the exceptional ones. They run in the circles of the rich and famous in a "Where's Waldo"-like fashion. They speak on a daily basis to the A-list celebrities, heads of State, creators of multi-million dollar corporations, sought-after lawyers, doctors in demand, top athletes, powerful executives, and brilliant entrepreneurs, yet you rarely ever take notice of them, or hear of their amazing deeds. These little known yet integral parts of our society have been around for many years. They go by the often ambiguous title of Personal Assistant. The dream is real. You too can do all of this and more. In fact thousands of people do every day. They're not all rich, may not have celebrity status, perhaps don't own a fancy house, and they might not even possess a large bank portfolio. So who are these people? They are the Personal Assistants who work for the rich, the famous, the tops in their fields, the crème de la crème. The world of the Personal Assistant can be exciting and fast paced. It can take you through a hundred new experiences in a week and promises to always keep you challenged. The job can make you laugh and it can make you cry. Its addictive nature can thrill you, making you beg for more. This is a book about the very essence of being a Personal Assistant. In it you will find the tools, the experiences, and the secrets about the lives of this elite group. You will learn all you need to perform this job with confidence and success." So why should you buy this Personal Assistant guide? Because you'll have immediate access to all the tools, tips, and tricks for finding and getting a great job as a Personal Assistant, and you'll have the secrets right at your fingertips on WHAT TO DO and how to perform your job once you get hired. And unless you have the right tools it won't matter who hires you. It's like getting a great job as a top chef and having no clue how to use a knife, which knife you need, or even what risotto is! Are they insane? This is my competition! I have known Craig over the years in the industry, as he is and has been a constantly working and well-connected personal assistant in the biz. So I was THRILLED to hear he finally wrote down all his secrets in a book to help others! Few people have worked as much as this guy and not been chewed up and spit out, so obviously he has been doing something right. As a working assistant myself, I am thrilled to get the tips and inside scoop from him as I am transitioning from an office assistant to personal. I cannot wait to apply all of his helpful advice to my new gig! This book is definitely worth a read to anyone trying to keep alive and happy in this job field! So I know the title is "The Celebrity Assistant's Handbook"... but it could also be "The Essential Guide to Running Your Own Crazy Busy Life." I loved the ideas for great time saving and all the organization tips. It's an easy read, communicating a lot of super useful information in a clear and simple way. I'm always leery of books of this kind (those who can't always seem to teach), but this guy is still a working personal Assistant and I've got to say that as critical as I am on books of this type, he had some really good points. Now the templates are simple, but they are logically thought out and instantly ready to use which I thought was a good added bonus. I originally found the ebook on the Internet and couldn't figure out why the price point for the on-line version was more than the paperback book on Amazon, though my guess is that it takes just a little longer to get the templates when you purchase the paperback version and so I guess that's why there was a price incentive. That being said, I thought the book was informative and felt like the writer put into practice what he preached. It gave a lot of good information that I can really make use of. Will recommend this to others. This book has alot of great information in it - with good tips and advice! This book is without question a "must have" for anyone planning to become a personal assistant or is currently a PA who is interested in ways to step up their game. 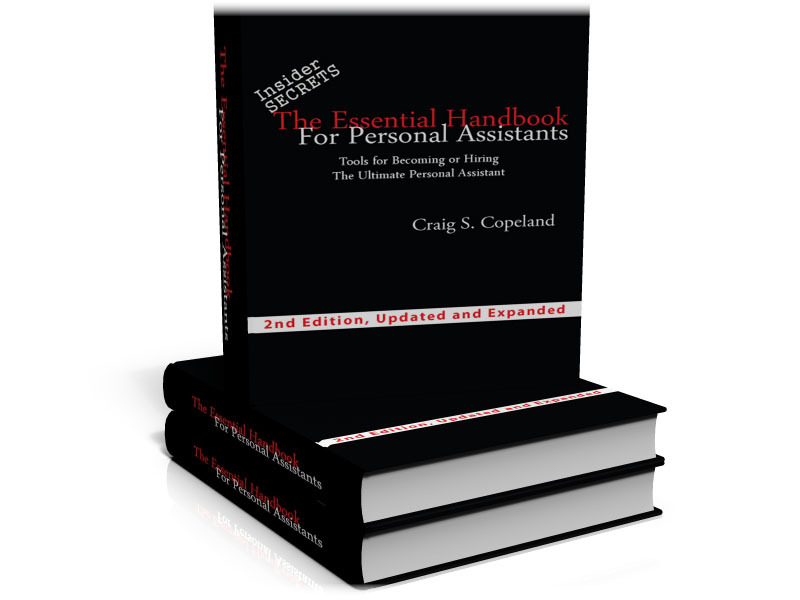 I am transitioning from another position and am confident that the road will be a lot easier to navigate thanks to" The Essential Handbook For Personal Assistants" and the fabulous downloadable templates. What an indispensable tool kit this is! Wish I had it a year ago! Great book!! I have been working as an assistant for two doctors the past year. I have tried to follow through with everything the book has suggested, and in doing so have completely blown my bosses away. I would highly recommend this book. I've been working as a Personal Assistant for about 3 years now and this book has some really good information that I never had before. I have to say that the job search section was a little weak and that I found other sources that have better search ideas but other than that this book is chocked full of good stuff. Even the downloadable templates proved very useful. I think the book is well thought out and I appreciate the work that went into the extra download tools. I'd recommend this book for people new to personal assisting but I also got a lot out of it and have been doing this a while now. Good stuff. The Essential Handbook is truly Essential! I ordered the item and when it arrived I was a bit disappointed at first due to the size of the book. HOWEVER, don't let the size fool you. This little black book is FULL of important information and tools for anyone who is an experienced Personal Assistant or starting out as one. The additional tools to be downloaded are a fantastic, especially if you are starting a new job. Sometimes you start a new job and there is no existing "bible" or someone who will train you until you get up to speed. Organization is key and the tools will definitely help you get and stay on track. I love this book and highly recommend it. It's really worth getting! First, view the sample eBook for free. Then, when you click on ANY of the Buy Now order buttons, you'll go to my secure order page for your credit card information (You can also order by PayPal if you choose). When you use my secure order form, you'll be able to download the book immediately as an Adobe Acrobat PDF file. And you'll receive a Thank You page and confirmation email which will give you access to important TEMPLATES that will streamline your job and catapult you instantly from a beginning Personal Assistant to an already valuable asset for any employer. Your transaction is secureusing our secure server, your order information is transmitted using the latest SSL encryption technology to ensure complete and total privacy and security. The whole process takes just a few minutes and you'll be reading your book in about 5 minutes. As a bonus to get you up and running fast with mad skill-sets that will make you an asset anywhere to anyone. You'll also have free access to download the forms and templates that will make ANY Personal Assistant a VALUED commodity. These are templates that seasoned professionals have been using for years! You'll increase your worth and make it hard for your boss to do without you. And you'll be years ahead of the competition! 2. The Bible This coveted tool is the key difference between a good Personal Assistant and one employers can't AFFORD to lose. 3. Travel Templates Everything you need to make travel seamless and flawless, whether you travel with them or not. 4. Calendars and Project Lists You will look like a miracle worker, staying on top of every event and upcoming project. Talk about grabbing the brass ring, with these forms, you may find that you suddenly have extra time on your hands while looking like a Rock Star. 5. "Call Sheets, Request Forms, To Do Lists" Even some of the top Executive Assistants and coveted Concierge don't have all the secrets you will have at your fingertips. Imagine his surprise when your boss calls you panicking about an upcoming project and you have it handled with all the answers at your fingertips. The Bible and the templates alone are worth their weight in gold. Someone else already took years to perfect and develop tools that you'll be able to use on your very first day! Imagine coming to your new job and looking like you've been doing this for years. Your boss's jaw will drop when he realizes he's just struck gold by hiring you! You'll have access to these Killer tools just like the seasoned professionals. These bonuses alone are worth over $150.00. And will save you valuable time! They might actually increase your income! They WILL increase your value, INSTANTLY. I wanted to give you a great deal to get you started right away and to really earn your business. That price includes the Bible and Templates! you want quicker and be on your way to an exciting, successful career. You get 100% of your money back if, after you read the book and apply the techniques for 30 days, you still don't think this book delivers, return it. No questions asked, it's that simple. Oh yeah, the 18 Bonus Templates are yours to keep! After you download these amazing tools you may kick yourself when you realize how easy they are to use. You'll become the best investment your boss has ever made. Once you've made your purchase you'll instantly be directed to a secured page and you can begin to download the guide and all the templates you'll need. P.S. If the creators of two top books for Personal Assistants are singing the praises of this book, doesn't it make you wonder what you'll be missing if you don't act right NOW? Personal Assistant Jobs - The job resource center for personal assistants listing 100s of personal assistant jobs.